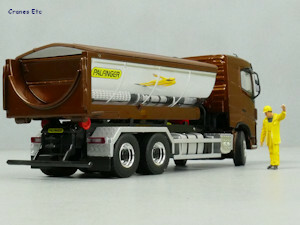 No number plate as this is a generic truck for Palfinger Marketing. 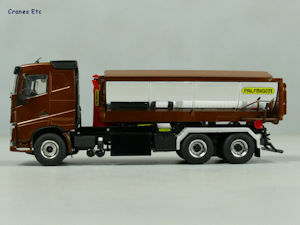 This truck is a Volvo FH4 Sleeper Cab 6x4 with a Palfinger Hooklift System and a Hooklift Asphalt Container. 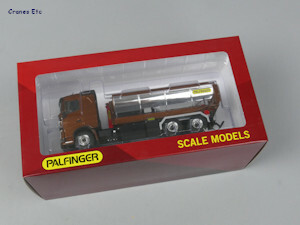 The box is Palfinger branded, and inside the packaging is the standard WSI type for a truck model. There were no missing parts on the review model. There was a small paint blemish on the front bumper, but this was barely visible under normal light. 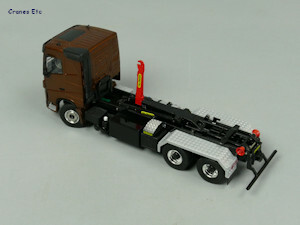 There is no information about the real truck, Hooklift System, or model. 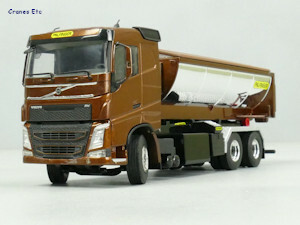 The Volvo chassis is a 6x4 arrangement and it is modelled with metal suspension and transmission parts. 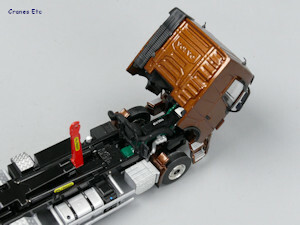 The wheels are very detailed with different tyres on the steering and driven axles. The cab has the distinctive front grille and there are colour-coded door mirrors. 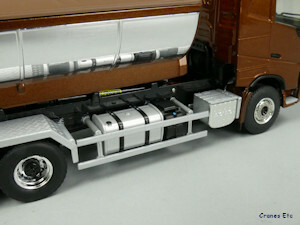 There are no number plates as this is a generic truck model to advertise the Hooklift System. Behind the cab there are good looking tanks with coloured caps, and diamond plated wheel arches. The Hooklift is modelled well, and the twin rams have metal jackets. 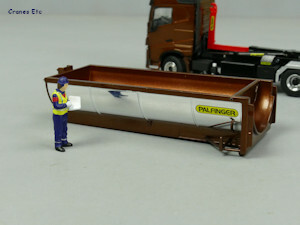 The asphalt container is half-pipe shaped, with a very reflective chrome exterior. It has a plastic cover which is textured to represent tarpaulin. 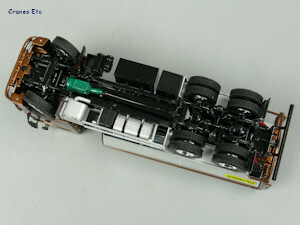 The front axle has limited steering, but there is enough to create a worthwhile pose. The cab tilts and stays tilted at a good angle, with a Volvo engine visible underneath. The movement of the Hooklift system is very good, and it includes a telescopic section, and any intermediate pose can be held. The rear rollers on the chassis turn. The tipping function for the container is also very good. 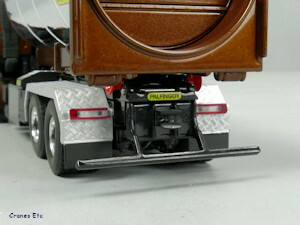 The container cover is removable, and the rear tailgate opens although it was not free-swinging on the review model. 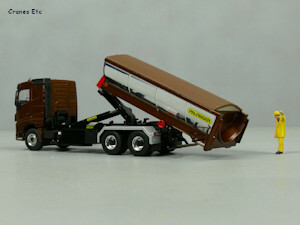 The rear roller on the container are not functional. It is well made with a high metal content and appropriate use of plastic. The paintwork is very good and the Palfinger graphics are sharp. The model is reasonable value. 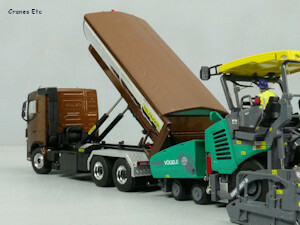 It is good to see this variation of a truck and the Hooklift System is a nice addition to the WSI range. 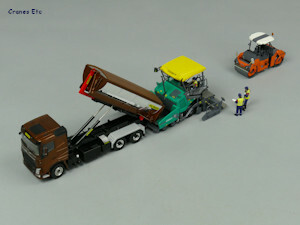 This version of the model poses well with other suitable models. 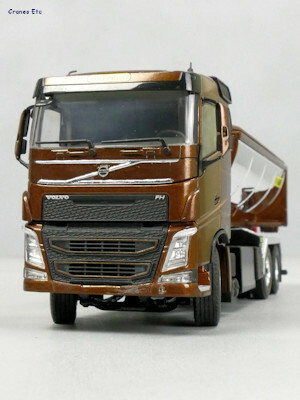 The model first appeared at the Nuremberg Toy Fair in January 2018. 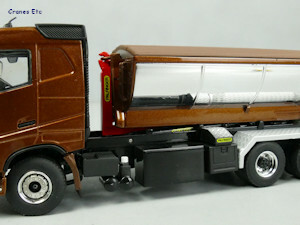 This model was also listed as WSI 04-2046. Good in a mini diorama.